Location: Spa hotel Enira is located close to the centre of Velingrad, offering a breathtaking view to the Rhodope mountain. 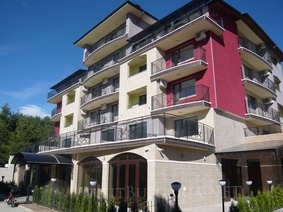 Accommodation: Enira hotel offers accommodation in 19 double rooms, 9 apartments. All rooms are beautifully decorated and offer all modern facilities and comforts. All rooms offer high speed internet, LCD TV, mini bar, telephone, air conditioner, fire safety system. All rooms offer a comfortable terrace with a beautiful view. Wine & dine: Guests of the hotel can taste delicious Mediterrenian and traditional Bulgarian dishes aT the restaurant of Enira hotel. Spa cetntre: Spa hotel Enira features indoor and outdoor swimming pools, sauna and a steam bath. Conference hall: Enira hotel offers a conference hall with a capacity for approximately 40 guests. The hotel provides a presentation screen as well as technical equipment for holding seminars and company gatherings.